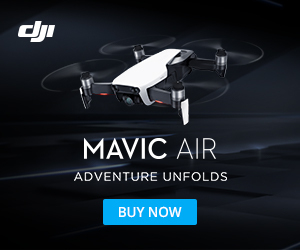 Is this going to be a standard feature on drones in the future? You’re flying your drone and for whatever reason it loses power and starts tumbling back to earth. Your investment will soon be broken into pieces when it hits the ground. Now you wish you had something to slow its decent. Well there is a company out of Israel by the name of ParaZero that may have a solution. They have developed a parachute system for drones. Beyond wanting to protect your investment in what could be thousands of dollars of drone hardware and camera equipment, a drone crashing on people and property could be another costly damage liability you might want to avoid. There is a clear need to ensure that the increasing numbers of drones filling the skies don’t pose a danger to the people or property on the ground. From private consumers and hobbyists to commercial applications of real estate, movie production, structure inspection and companies such as Amazon, Google, and Walmart looking at drone delivery services the safety of both people and property is a concern. Redundant back-up systems for a safe landing would be nice. When one of these vehicles loses power you don’t want it falling on you from above … a softer parachute landing might be a better option. According to their March 2016 news release, ParaZero, a startup, has developed a safety solution for aerial systems such as UAV’s / drones. See above video of ParaZero’s solution in action. Quick Full Formation Deployment – the system uses a customized pyrotechnic device that actively deploys the parachute to its full formation in a fraction of a second which provides for deployment in low altitude situations, where other systems may not be able to fully deploy. The technology protects aerial systems of all shapes and sizes, including all UAV, UAS, and drone platforms. Stand-Alone Auto Deployment System – the ParaZero does not rely on the drone’s own systems and sensors, but instead utilizes a complete stand-alone auto deployment system. Thus in the case of a loss of power or control, breach of flight envelope limits, penetration of GEO fencing, and other emergencies, the auto deployment system independently detects and automatically deploys the parachute. Lightweight – the recovery system is made from composite lightweight materials. Custom Design – Each system is custom made and embedded to fit the platform design, specs, and appearance of the aerial system. The safety solution can also be an independent add on, or dull integrated, according to the needs of the customers.